Pixel Scroll 12/21/18 Golden The Ship Was Ho! Ho! Ho! There’s a flock of character posters, too. Mankind has split the atom, sent a man to the moon, and now, in arguably its most unlikely achievement, it has produced a watchable Transformers movie. There’s really no scientific expression for how low Michael Bay’s five previous Transformers movies have set the bar, but it’s not enough to praise Bumblebee, the diverting new spin-off/prequel, for basic visual coherence or evidence of identifiable human emotion. It does better than that, imbuing the commercial cynicism of a Hasbro product with the borrowed warmth of E.T. : The Extra Terrestrial, Splash, and a soundtrack so chock-a-block with ’80s favorites that it gets from The Smiths to Steve Winwood in a hummingbird’s sneeze. Though Bay has stayed on as producer, director Travis Knight, who made the wonderful Laika animated film Kubo and the Two Strings, and his screenwriter, Christina Hodson, almost make a point of crumpling up his vision and tossing in the waste basket. Gone is the Bay’s risible mix of mythology and militarism, replaced by simplified conflict and an emphasis on the friendship between an outcast and an exile. Gone also is the leering, dorm-room poster sexuality, replaced by a notably chaste teen romance that doesn’t get past first base. Bumblebee seems to have more of a family-friendly mandate than Bay’s Transformers movies, but the lightness and earnestness serves the material well. Movies inspired by toys tend to crack like cheap plastic under too much weight. The long and bleak year of 2018 is almost over. It was a year full of devastating storms and disasters, scandal after scandal from tech companies, and chaotic politics from around the world. If there was any bright point in the year, it was that 2018 also brought with it a bumper crop of fantastic science fiction, fantasy, and horror novels that served as an oasis to examine the world around us, or to escape for brighter pastures. The best books of this year told stories of interstellar colonization, of fantastic magical civilizations, optimistic alternate worlds, and devastating potential futures. They brought us fantastic characters who sought to find their places in the vivid and fantastic worlds they inhabited. Set in the distant future, humanity survives on a planet wrecked by climate change and plagues in Larissa Lai’s latest novel The Tiger Flu, which follows a community of cloned women who are battling for their very survival waged by illness and economics. Lai’s story follows two women: Kirilow, a doctor of Grist Village whose lover Peristrophe dies of a new strain of flu. Peristrophe was vitally important to their community — she could regrow her limbs and organs, and following her death, Kirilow sets out to Salt Water City to try to find someone to replace her. There, she meets Kora, a woman living in the city who might be able to save her community, but who resists leaving her family behind. Lai’s story is an intriguing post-apocalyptic novel, one rife with biotech and the remnants of the world from before. (6) MOFFAT OBIT. You saw him a lot, but did you know his name? “Donald Moffat, Commander Garry in John Carpenter’s The Thing, passes away at 87” – details at Syfy Wire. Donald Moffat, the English actor most known for playing station commander Garry in John Carpenter‘s 1982 remake of The Thing, has died at the age of 87. According to The New York Times, Moffat passed away Thursday in Sleepy Hollow, New York, after complications arose from a stroke six days before his 88th birthday. … Born in Plymouth of the U.K.’s Devon County in December of 1930, Moffat moved to the United States at the age of 26 to pursue a full-time acting career. Besides The Thing, the actor appeared in a number of other genre projects, like Night Gallery, The Terminal Man, Logan’s Run (the TV series), Exo-Man, Popeye, The Right Stuff, and Monster in the Closet. (7) MASTERSON OBIT. “Peter Masterson, Actor, Director and ‘Best Little Whorehouse in Texas’ Writer, Dies at 84” — The Hollywood Reporter has the story. (8) ICONS LOST IN 2018. Last week, Turner Classic Movies posted its annual in memoriam video. Harlan Ellison, Jerry Maren, William Goldman, Gary Kurtz, Margot Kidder, and Stan Lee are some of the genre figures shown. In loving memory of the actors and filmmakers who have passed away in 2018. We will remember you for all time. December 21, 1968 – Apollo 8 launches. The Washington Post’s Joel Achenbach notes the 50th anniversary of Apollo 8. “No space mission had ever presented so many exotic ways to kill astronauts,” Achenbach writes. “Apollo 8: NASA’s first moonshot was a bold and terrifying improvisation”. Walter Cronkite held a tiny model of the Apollo 8 spacecraft and strode across a darkened studio where two dangling spheres represented Earth and the moon. This was the CBS Evening News, Dec. 20, 1968, and three Apollo 8 astronauts were scheduled to blast off the following morning on a huge Saturn V rocket. Cronkite explained that the astronauts would fly for three days to the vicinity of the moon, fire an engine to slow the spacecraft and enter lunar orbit, circle the moon 10 times, then fire the engine a final time to return to Earth and enter the atmosphere at 25,000 miles per hour. “They must come in at JUST the right angle. If they come in too steeply, they will be CRUSHED in the Earth’s atmosphere. If they come in too shallow, they will SKIP OUT and go into Earth orbit and not be able to return,” Cronkite said…. Born December 21, 1937 – Jane Fonda, 81. Sure everyone here has seen her in Barbarella? Her only other genre appearances are apparently by voice work as Shuriki in the animated Elena of Avalor series, and in the Spirits of the Dead, 1968 anthology film based on the work of Poe. She was the Contessa Frederique de Metzengerstein in the “Metzengerstein” segment of the film. Born December 21, 1948 – Samuel L. Jackson, 70. Where to start? Did you know that with his permission, his likeness was used for the Ultimates version of the Nick Fury? It’s a great series btw. He has also played Fury in the Iron Man, Iron Man 2, Thor, Captain America: The First Avenger, The Avengers, Captain America: The Winter Soldier, Avengers: Age of Ultron and Avengers: Infinity War and showed up on Agents of S.H.I.E.L.D. too! He voiced Lucius Best (a.k.a. Frozone) in Incredible and Incredibles 2, Mace Windu in Star Wars: Episode I – The Phantom Menace and Star Wars: The Clone Wars, the Afro Samurai character in the anime series of the same name and more other genre work than can be listed here comfortably so go ahead and add your favorite role by him. Born December 21, 1962 – Kevin Murphy, 56. American actor and writer best known as the voice and puppeteer of Tom Servo on the Mystery Science Theater 3000. And he does RiffTrax which are humorous audio commentary tracks intended to be played along with various television programs and films. Born December 21, 1966 – Kiefer Sutherland, 52. My, he’s been in a lot of genre undertakings! I think that The Lost Boys was his first such of many to come including Flatliners, Twin Peaks: Fire Walk with Me, The Nutcracker Prince, The Three Musketeers, voice work in Armitage: Poly-Matrix, Dark City, more voice work in The Land Before Time X: The Great Longneck Migration, Marmaduke and Dragonlance: Dragons of Autumn Twilight, Mirrors, and yes he’s in the forthcoming second Flatliners as a new character. Born December 21, 1971 – Jeff Prucher, 47. Won the Hugo Award for Brave New Words: The Oxford Dictionary of Science Fiction which to my knowledge is still the only historical dictionary of words originating in sf, plus citations and bibliographic information for them. If there’s another one, I’d like to know about it. (11) DON’T JUDGE BY CHARACTERS ON TV. Ada Hoffman told Twitter readers, “[If] you are NT, I am going to explain several reasons why you SHOULD NOT EVER judge if a character is ‘autistic enough’ by how well they match autistic characters on TV. Any TV.” Thread starts here. Second: Some autistic rep on TV tries to do better, but still has characteristic inaccuracies and stereotypes. A really common problem is when a writer wants to be "good" and "accurate," so they talk to… doctors. Why is this a problem? I will explain. (12) SPACE DOESN’T HAVE ENOUGH SPACE? The Man Who Sold The Moon, Delos Harriman, died before authorities could smother him with paperwork for his illegal mission – not so Swarm co-founder and Chief Executive Officer Sara Spangelo: “FCC fines Swarm $900,000 for unauthorized satellite launch”. The California-based start-up founded by former Google and Apple engineers in 2016 also agreed to enhanced FCC oversight and a requirement of pre-launch notices to the FCC for three years. Swarm launched the satellites in India last January after the FCC rejected its application to deploy and operate them, citing concerns about the company’s tracking ability. (13) COUNTERING ROGUE DRONES. [Item by Chip Hitchcock.] BBC chronicles “Gatwick airport: How countries counter the drone threat”. Context: per another BBC post, possibly 100,000 or more passengers grounded due to somebody flying at least one drone around the airport. It’s unclear so far whether it was a random idiot, or somebody deliberately harassing; the latter reminds of Christopher Anvil’s “Gadget vs. Trend” which is framed by quotes from a sociologist complaining first about rampant conformism and last about rampant individualism, after a device has allowed people to be … disruptive. Rogue drones “deliberately” flown over one of the UK’s busiest airports caused travel chaos this week. Incoming planes were forced to divert to airports up and down the country as the drones, or unmanned aerial vehicles (UAVs), repeatedly appeared over the airfield at London’s Gatwick Airport. The situation was so serious the Army was called in to support the local police in tackling the issue, with the runway finally re-opening on Friday morning. For some time now, governments around the world have been looking at different ways of addressing the dangers of drone use in areas where they pose safety risks. Here we look at some of the solutions – ranging from bazookas to eagles. (14) 770 FROM 770 IS NOTHING. Here’s the real reason for today’s diminished sunlight — senpai has stopped noticing me! Several of these awards were declined and that probably should have been noted somewhere. (15) SAD FOR REAL. No explanation why yet, but “Scientists Find A Brain Circuit That Could Explain Seasonal Depression”. Just in time for the winter solstice, scientists may have figured out how short days can lead to dark moods. Two recent studies suggest the culprit is a brain circuit that connects special light-sensing cells in the retina with brain areas that affect whether you are happy or sad. When these cells detect shorter days, they appear to use this pathway to send signals to the brain that can make a person feel glum or even depressed. (16) YA DESERVING YOUR ATTENTION. Surprisingly, all six books chosen by Vicky Who Reads for “Best of 2018: Hidden Gems + Underappreciated Books” are sff. There are so many amazing books this year that I personally think did not get enough hype or recognition, and today’s all about highlighting some of the quieter YA releases that you should definitely check out! Every single book on this list and the ones to come are books that I’ve already read + loved, but obviously there are 2018 novels I haven’t read and could definitely qualify. But, alas. It is not to be. I feel like in end of the year lists, we oftentimes forget about books that published earlier in the year, but Undead Girl Gang is a book I looooved! Not only did it star a fat Hispanic MC, but it’s also a really great book about friendship? I mean, this girl has her mean girls revived as “zombies” of sorts (just not…flesh eating) and I loved seeing how they resolved their differences throughout the novel. It was not only super nice to read about friendship and not a lot of romance, but I also really loved the sort of fun narrative style that makes you enjoy what’s happening and not take it too seriously! (17) OUTWARD MOBILITY. Paul Weimer makes a recommendation at Nerds of a Feather: “Microreview [book]: Implanted, by Lauren C Teffeau”. Lauren C Teffeau’s Implanted combines future cyberpunk beats with a climate changed ravaged future, a vertically oriented arcology setting, and a strong central character with a thriller chassis for an entertaining read. …The strength of the novel is Emily as a flawed, complicated character with lots of fiddly bits to her personality and story. Far from being a smooth operator when dropped into her new, unwelcome situation, and on the other hand, avoiding the trap of making her a completely clueless newbie without any skills, the author creates Emily as someone with strengths and weaknesses, in terms of skills and personality, that become plot relevant and interesting to her development and growth. Her desire to reconnect with her former life, damn the consequences, is a major driver of the plot as well. (18) FELINE NAVIDAD. Camestros Felapton’s “Carols with Catnip” features seasonal music behind a video visage of Timothy the Talking Cat. It’s sort of like that Sauron eye fireplace video, except even more horrifying! This entry was posted in Pixel Scroll and tagged Andrew Liptak, Apollo 8, Bumblebee, Camestros Felapton, Daniel Dern, Jeff VanderMeer, John Scalzi, Marc Scott Zicree, Paul Weimer, Space Command, Stephen Colbert, The Doom Patrol, Timothy the Talking Cat, Transformers, Vicky Who Reads by Mike Glyer. Bookmark the permalink. But nothing in her piece substantiates that this is anything but someone engaging in persistent, malicious obstruction. It might be intended to be more — but civil disobedience, like terrorism, only achieves something if it is spelled out what is being done and why, and what is expected in order for the activity to stop. And an important aspect of it is winning a measure of public support for their goal, whether by fear or by sympathy. If the people doing it are intending it to be civil disobedience, unfortunately all they’re actually achieving at this point is being assholes. I don’t see how that is going to further whatever their cause might be. Police aren’t sure there ever was a drone, so talking about “activists” seem a bit premature. Here is some very random speculation from someone who spent several years on college working on raptor rehabilitation, which included traditional falconry training. The first thought I have around health concerns for the birds is that raptor feet (indeed all bird feet) are very susceptible to even minor injuries turning nasty. (Very low circulation as part of the structural design.) This is a major concern when using raptors to hunt prey likely to bite. (We trained rehab red-tails on their natural prey: small rodents. Every hunting run was followed by careful inspection for bite wounds.) So one concern with hunting drones would be the potential for the rotor blades to inflict foot injuries. I know that most “toy” drones are designed with safety features around the blades, but if someone were deploying them with ill intent, and knew that birds were being used as a defense, you could design a drone that could do a lot damage. Some other random thoughts just for the curious: North American readers might be overly impressed by the choice of eagles for the program. If a program like this were being done in the US, it’s almost certain that the bird of choice would be a red-tailed hawk. They’re plentiful, not at all endangered–one of the two species allowed to beginning falconers–and have a fairly calm temperament compared to, for example, falcons. The closest European relatives of the red-tail (sp. Buteo) are smaller and generally disdained for falconry training. 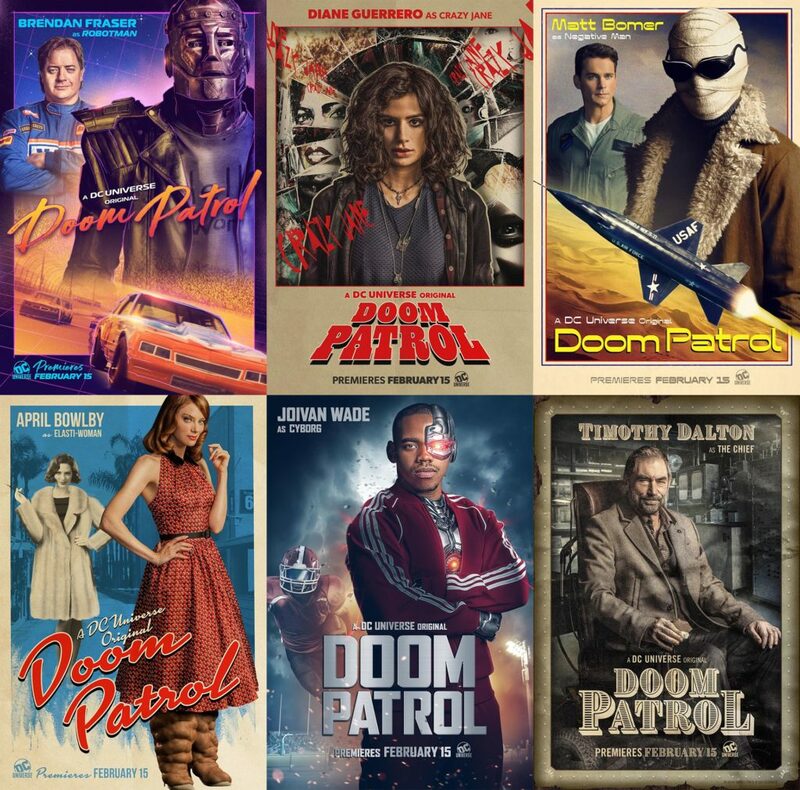 @1 [Doom Patrol teaser]: another show I won’t watch — but I wonder whether there’s a reason for that specific music; does the show take place then? Since DC’s new TITANS streaming series, in which the DP guest appearaed (see my item in some prior post), is contemporary, I assume that the DP series will also be current, and that the tune, and that performance was selected purely for whimsey. The song is mentioned in the 1997 book Harry Potter and the Philosopher’s Stone. Vernon Dursley hums the song while boarding up small cracks around the front and back doors of his house so he can stop letters from Hogwarts reaching Harry. @Heather Rose Jones: Thank you for the hard data. I remember (IIRC from doing production on the Compleat Anachronist falconry pamphlet) that red-tails (as of ~35 years ago) were so plentiful as to be the only bird allowed to novices; however, would they be big enough to take on any of the larger polycopter drones? I’ve only seen one drone up close; that one was very light, but some of the others available to civilians (e.g., the chainsaw carrier in the FoL link) look much more substantial. I suspect the French used eagles because they wanted to give the bird a better chance; I was wondering how they found enough. (I could point them to Sitka harbor, where baldies have taken over the ecological ~niche of seagulls, but getting eaglets from there would make the local raptor rehab center unhappy.) I can see serious foot damage being an issue; one of the articles I’ve seen (maybe @Contrarius’s) mentioned some form(s?) of protection the birds wore. How likely is it that birds could be trained to attack the center of a polycopter, avoiding the splayed propellers? Whether we want to call it civil disobedience or terrorism, this drone stunt is actively malicious. There’s not just the risk to aircraft and the lives of their passengers and crew, but the perpetrators also chose to do this during one of the busiest times of the year at any airport, when thousands of people are either trying to get home for the holidays or trying to go on holiday in sunnier climes. And ruining the holidays for thousands of people is actively malicious. As for “Oh, but they’re just hurting the privileged”, that’s crap. Flying hasn’t been only for the privileged in a long time now and Gatwick doesn’t just have long distance flights (those mostly go via Heathrow, though Gatwick has some), but plenty of domestic and inner European flights, including plenty of flights by budget airlines and holiday flights. Also, the UK, particularly London, (still) has plenty of citizens from other European (and non-European) countries living there. And those citizens are not just privileged jet setters and business people, but they are nurses, doctors, teachers, students, agricultural workers, cleaners, etc…, i.e. ordinary people just trying to get by in one of the most expensive cities in the world. A lot of these people want to visit their families at home for the holidays. And because of these drone-flying jerkwads, a lot of them are stranded now. Besides, Britain is an island, which means that there aren’t that many ways to get off. You could use the Eurostar, which is bloody expensive, takes a lot longer than flying and is not viable for people with claustrophobia, who cannot abide the Eurotunnel. Plus, it only goes to Paris or Brussels. Or you could take a ferry, which can also be pretty expensive, is a lot more vulnerable to bad weather (and winter storms are a thing in North West Europe), takes a lot longer and is not viable for people who have issues with sea travel. Plus you first have to get to the port and then have to get from the port on the other side to wherever you’re going. And a lot of the EU citizens living in Britain are Poles, Germans, Romanians, etc…, i.e. Calais is about as far from home for them as London. And while Germany at least used to have direct ferry connections to the UK (though we no longer do), Poland doesn’t, let alone Romania. So in many cases, flying is the easiest way to get out of the UK. When I was a student in London twenty years ago, I flew home via Gatwick, because that was the easiest and quickest way even back then. The Eurostar already existed, but it was way too expensive, especially if I had to take a train home from Brussels, too. And ferries aren’t viable for me, because I’m terrified of RoRo ferries (and with good reason, too – look up Estonia or Herald of Free Enterprises) and basically every North Sea ferry is a RoRo ferry. So I had the choice to pay through the nose for the Eurostar, spend twelve hours terrified on the Cuxhaven Harwich ferry (which was still in service at the time, though they’ve since suspended service), freezing half to death on deck, and paying a lot of money for the privilege, or take a plane that takes me directly to my hometown in one and a half hours. And I was far from privileged, especially as a student. So if whoever started those drones was protesting climate change, they could have done so during a low traffic week outside the holiday time, where the chances of hitting mostly business travellers are highest. They chose to do this during one of the busiest times of the year, when a whole lot of not very privileged people are flying, and that’s actively malicious. Also, if you think that ferries are good for the environment, have I got news for you. If a program like this were being done in the US, it’s almost certain that the bird of choice would be a red-tailed hawk. No, red tails would never work against drones. They are not nearly heavy enough or aggressive enough for the job. Remember, golden eagles are used to hunt WOLVES in some parts of the world. They are very big and strong and aggressive. An entirely different beast from buteos or falcons. So they’re now saying there never were any drones. Could this be a case for Mulder and Sculley? I suppose that depends on the hypothetical weight of the hypothetical drones we’re talking about. Keep in mind that the bird doesn’t have to lift the drone, just disrupt it substantially enough to take it out. In medieval falconry, peregrines were habitually flown against cranes, which could be anywhere from two to four times their weight. But I will, of course, defer to your greater experience with birds of prey. As I say, I only trained and hunted with them for rehab purposes, and I never directly handled the eagles at the rehab center. Keep in mind that the bird doesn’t have to lift the drone, just disrupt it substantially enough to take it out. That’s true, of course — but there’s gonna be a huge difference between the force an eagle can hit a drone with compared to buteos, and also a huge difference in the likelihood of injury to the bird. Red-tailed hawks weigh around 2.5 pounds. Golden eagles in the wild weigh up to 15 pounds, and captive-bred ones can weigh up to **27** pounds. And as I mentioned, golden eagles can take on wolves. They are tough buggers. Also, as you mentioned yourself earlier, one of the reasons why red tails are popular for novice falconers — aside from their commonness and ease of maintenance — is their relatively calm temperament. But calm isn’t really what you want when you expect a bird to aggressively go after things like drones. Additional fun fact that I just learned yesterday — although peregrines are usually called the fastest flyers, golden eagles can also reach up to at least 200 mph in a dive and may actually be just as fast as the falcons. Red-tailed hawks apparently top out around 120. Multiply that extra speed by how much heavier the eagles are, and you’ve got one helluva wallop. There are videos around of Wedgetail eagles taking out drones in Aussie – impressive birds, no surprise the the RAAF named their surveillance aircraft after them. aww, thank you so much for linking up my post! so glad you enjoyed my recommendations and Undead Girl Gang is truly awesome!